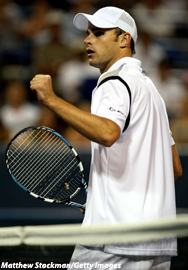 WASHINGTON (AP) -- Andy Roddick and his powerful serve are doing just fine. Roddick fired off 18 aces and beat Tomas Zib 6-4, 6-2, to reach the third round of the Legg Mason Tennis Classic on Tuesday night. It was the first match for Roddick, a two-time winner of the event and this year's top-seeded player, since losing to Frank Dancevic in the semifinals last week in Indianapolis. Roddick said Monday he was slowed in that match in part because of an upset stomach brought on by a late-night fast food meal. But Roddick looked healthy enough against Zib. He broke serve to take a 4-3 lead in the first set, which he finished off three games later with an emphatic ace that came after he saved two break points. Roddick had 12 aces in the first set. He took control of the second set by breaking Zib at love to take a 2-1 lead. In the third round Roddick will face either 15th-seeded Radek Stepanek or Rockville, Md., native Paul Goldstein, who reached the second round Tuesday by beating Somdev Dev Varman 6-4, 6-2. Third-seeded Marat Safin had a much tougher time than Roddick, finally beating Jan Hernych 6-2, 2-6, 6-2 to reach the third round. After a relatively easy first set, the Russian finally retook control by winning the last four games of the match, including the decisive break that gave him a 3-2 lead. Also reaching the third round was fifth-seeded Hyung-Taik Lee, who beat Russia's Igor Kunitsyn 6-7 (7), 6-3, 6-1. Ninth-seeded Gael Monfils of France, beat Martin Klizan 7-6 (5), 6-4. Robin Haase beat 14th-seeded Michael Llodra 6-2, 6-7 (7), 7-6 (4). In a first round match, Tim Henman double-faulted on match point in a third-set tiebreaker to hand American John Isner a 4-6, 6-4, 7-6 (4) win in just his second ATP tour event. Isner used a serve that routinely topped 130 mph to beat the tournament's 2003 champion. Henman looked like he was in control after a first set in which he lost only four points on his serve. But Isner broke Henman to end the second set and forced Henman to save two match points serving at 4-5 in the third. Isner, who will play Germany's Benjamin Becker in the second round, had three of his 18 aces in the tiebreaker. In other first round action, South Africa's Wesley Moodie beat American Ryan Sweeting 6-3, 6-4 and Wesley Whitehouse, also of South Africa, beat Jiri Vanek 3-6, 6-3, 6-3. Germany's Michael Berrer beat George Bastl 6-3, 6-2 and American Wayne Odesnik beat Adrian Garcia 4-6, 6-3, 6-0.